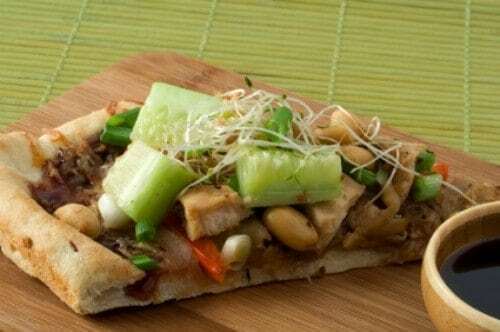 California Pizza Kitchen Thai Chicken Pizza can be made at home. Combine sauce ingredients in a small pan over med. heat. Bring the sauce to a boil; boil gently for one minute. Divide into 2 portions for use on chicken and pizza; set aside.To make Thai chicken Cook the chicken in olive oil over med-high heat, stirring, until just cooked; 5 to 6 minutes do not overcook. Set aside in refrigerator until chilled through. Once chilled, coat the chicken with 1/4 cup sauce. Set aside in refrigerator.To make the pizza Use a large spoon to spread 1/4 cup sauce evenly over pizza dough within the rim. Cover sauce with 3/4 cup cheese. Distribute half the chicken pieces over the cheese followed by half the green onions, bean sprouts, and carrots, respectively. Sprinkle an additional 1/4 cup cheese over the toppings and top the pizza with 1 tablespoon chopped peanuts. Transfer the pizza to oven; bake until crisp and golden and the cheese is bubbly, 9 to 10 min. When cooked through, remove pizza from oven. Sprinkle 1 tablespoon chopped cilantro over the hot cheesy surface. Repeat with remaining ingredients for a second pizza. I love this pizza I order this allot when I go to California Pizza Kitchen. I will try this at home and see if it is just as good!